In the 1960’s, the American Academy of Ophthalmology (AAO) frequently held their annual meetings in Chicago, Illinois, with headquarters at the Palmer House. The few Chinese American Ophthalmologists in attendance would often go to a Chinese restaurant to share their culture and common interest of ophthalmic practice in the United States. In the 1980’s, the number of Chinese American Ophthalmologists attending the American Academy of Ophthalmology meetings increased. A need to form a more formal organization was proposed. In 1986, at the AAO meeting in New Orleans, Louisiana, a group of Chinese American Ophthalmologists formed an official organization. The name Chinese American Ophthalmological Society was adopted and was known in its shortened form as CAOS. A logo was agreed upon as the official symbol. CAOS was formally registered in the AAO program as an "alumni and related group." 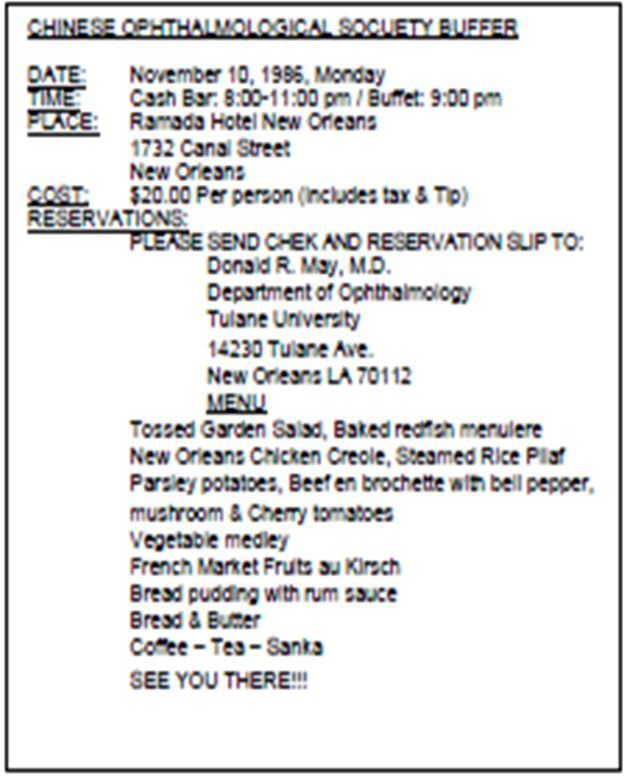 The first CAOS AAO Banquet Program was held in Dallas, Texas, during the 1987 AAO Annual Meeting. On May 7, 1990, thanks to the efforts of key in dividuals, CAOS was officially baptized and given non-profit organizations and tax exempt status by the IRS. CAOS was formed for charitable, educational, and scientific purposes, specifically for the advancement of medical knowledge and scientific research in Ophthalmology, and to assist in the education and training of Ophthalmologists of Chinese descent. CAOS provides for Ophthalmologists of Chinese descent in the United States to promote friendships, share experiences and resources, and to foster a collaborative spirit. CAOS also promotes Ophthalmology and east-west exchanges to improve patient care, education, research and scholarship. 3. Act as a bridge between Ophthalmologists to exchange views in education, research, and patient care in China, Taiwan, Hong Kong, and the USA. CAOS is not a political organization and its bylaws prohibit individuals from using the name of the organization to express or further an individual’s political goals or desires. Legacy: CAOS could not have been brought to fruition without the following physicians: JS Chao, Peter Chao, Helen Chi, Otis Lee, Henry Li, CK Liao, CC Teng, Robert Wong and others.